The lesson of the Greek temple: Thousands of years ago people discovered that stone was a great building material. Look at all the advantages: Stone lasts for ages in all kinds of weather, stone is durable and not easily damaged, and stone looks great. They also learned that stone had some shortcomings. While solid stone can withstand very high compression forces (a pushing force), it is much weaker under tension (a pulling force). To overcome this weakness the early builders had to use very short spans of stone. 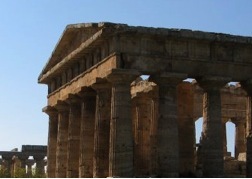 The principle can be seen in the columns of a Greek temple. The Greeks columns were spaced very close together to prevent the stone beams they supported from breaking due to tension. Later, people used iron, wood or steel for construction because of their higher tensile strength. But these other materials lacked stones long term durability, resistance to fire and resistance to rust, rot and corrosion. Today, StonePly offers architects and builders the best of both worlds. StonePly combines the durability, beauty and strength of stone and with the high tensile strength, impact resistance, lightweight and ease of use of aluminum. The stone provides the durable good looks and weather resistance while the aviation type advanced aluminum honeycomb composites provide the strength. StonePly cladding goes up faster, stronger and with less load on the building structure. StonePly stone panels are easier to handle and easier to transport. StonePly stone panels have 60 times the impact strength of solid granite. In addition, large 4’ by 8’ panels can be used. Have Questions? Need design details? Call us, we are here to help. Our experts will assist you with panel sizes, stone options and attachment options.